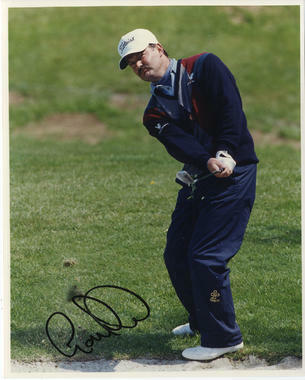 This is an In Person Signed Colour 10" x 8" Photo of the Scottish Professional Golfer. Gordon Brand, Jnr (born 19 August 1958) is a Scottish professional golfer who plays on the European Tour. Brand was born in Kirkcaldy. He turned professional in 1981 and quickly achieved success. He won that year's European Tour Qualifying School, and went on to win two European Tour events in his rookie season. He went on to accumulate eight wins on the tour in total, the last of them in 1993. He also won the 1988 West End South Australian Open. He made the top ten on the European Tour Order of Merit six times, with a best placing of fourth in 1987. He last made the top one hundred on the Order of Merit in the 2000 season, during which he turned forty-two. In 1979 Brand played in the Walker Cup amateur team competition. His two Ryder Cup appearances were in 1987, when Europe won on American soil for the first time, and in 1989 when Europe retained the trophy at The Belfry by tieing the matches fourteen all. Brand had a 2-4-1 win-loss-tie record, including one tie and one loss in his singles matches.